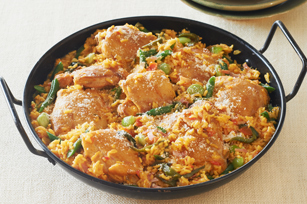 This Valencia-style paella dish is flavoured with smoked ham and roasted poblanos for a Mexican twist. Heat oil in large skillet on medium-high heat. Add chicken; cook 4 min. on each side or until browned on both sides. Move chicken to one side of skillet. Add ham, tomatoes, onions and garlic to other side of skillet; cook 4 min. Mix next 4 ingredients until blended. Add to skillet along with the bouillon cube; stir. Bring to boil. Stir in rice and chiles; simmer on medium heat 6 min., stirring occasionally. Add beans; stir. Cover; simmer on medium heat 20 min. or until beans are tender, stirring occasionally. Remove from heat; let stand 5 min. Top with cheese. Chiles can be roasted, peeled and chopped ahead of time. Store in refrigerator up to 24 hours before using as directed. Prepare using frozen lima beans.